The Cristoforo Colombo in dry-dock. You may read elsewhere in this encyclopedia about the general history of the Castellammare shipyards near Naples. Also, there is a brief entry on the three-masted Italian navy training vessel, the Amerigo Vespucci, and a recent Italian Navy Day celebration in Naples. What follows below is about the Vespucci's sister-ship, the Cristoforo Colombo. And all I ask is a tall ship and a star to steer her by,...". 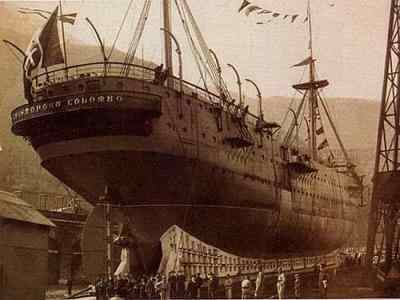 The keel of the Cristoforo Colombo was laid at the Castellammare yards on April 15, 1926, and the ship was launched on April 4, 1928, somewhat before the Amerigo Vespucci; thus, the Colombo was older—the "big sister." The Cristoforo Colombo was originally to be named Patria, but that was changed during construction. 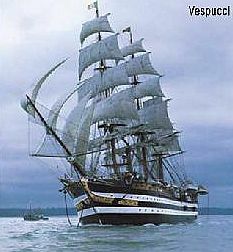 (The Vespucci was launched in Castellammare on February 22, 1931. They were "twins," (though not exactly identical—more below), both fully rigged sailing vessels on the design of the late 18th-century 74-cannon "ships of the line." Both the Colombo and Vespucci were modeled specifically on the earlier Monarca, the flagship of the fleet of the Kingdom of the Two Sicilies, launched in 1850 at the Castellammare yards (strangely, well past the glory days of such ships and well into the new age of steamships). By definition, such ships have three or more masts, all square-rigged, referring not to the shape of sail, itself, but to the fact that the sails are carried on horizontal spars which are perpendicular to the keel of the vessel and to the masts. Although the ships were called twins, there is some difference in construction, mainly in the placement of the masts. After the Colombo was launched and while the Vespucci was still being planned, a major incident took place at sea: the still unsolved disappearance of the magnificent five-masted Danish sailing ship, København, in late 1928. Her voyage from South America to Australia via The Cape of Good Hope and the Indian Ocean was to have taken six weeks. Last radio contact was with a Norwegian steamer on December 21, seven days after the København had set sail from Buenos Aires. After that—nothing. No wreckage or survivors of the 60-man crew was ever found. There was speculation that sailing without ballast had caused instability; further, that maybe that problem could be addressed by adjusting the masts somewhat on ships of similar construction. That was done to the Vespucci; that is the main difference between the Colombo and the Vespucci. The Colombo and Vespucci both undertook nine lengthy training cruises during the 1930s until the outbreak of WWII, at which point they remained as training vessels in the Italian Navy. The Vespucci is still with us; the Colombo is not—for reasons that have nothing do with high seas or battles or any such rollicking notions. No mystery, either. One of the goods was the Cristoforo Colombo. The ship was turned over to the Soviet Union in 1949. They renamed her the Dunay (Russian for "Danube") and put the ship into service as a training vessel for young Soviet sailors at Odessa on the Black Sea, where she served until 1959. The subsequent history is hazy. One source says the old Colombo was then ceded to the Odessa Nautical Institute; other reports says she was used to haul freight on the Black Sea. The Cristoforo Colombo/Dunay was abandoned in 1961 and then demolished at a shipyard in Leningrad (St. Petersburg). Her little sister still sails on, and a beautiful sight she is (photo, above right). 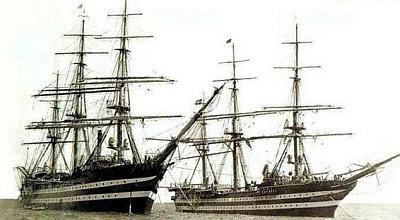 Both the Cristoforo Colombo and the Amerigo Vespucci were modeled on the Monarca, the flagship of the Kingdom of the Two Sicilies at the time of the unification of Italy (1861); that vessel was taken up into the fleet of the new Kingdom of Italy. acknowledgment: I have drawn details of the history of the Cristoforo Colombo from the mondovespucci website. It is primarily in Italian, but some of the pages are also in English. note: There was another well-known Italian ship named the Cristofero Colombo, the ocean liner launched in 1953 to be the sister ship of the Andrea Doria. The Andrea Doria sank in a collision in 1956; the Cristofero Colombo eventually went into service in the Adriatic and then on the South American run until 1977. She was sold to Venezuela and then to Tawainese scrappers in 1981; she was scrapped in 1982.